Apple force-fed the fashion community its new Apple Watch this week with a 12-page ad-spread in Vogue. However, a company called Brikk has made a much more appealing pitch with its incredible iced-out versions of the watch. The company, which specializes in tech customization, is offering a version of the Apple Watch that will set you back $75,000. 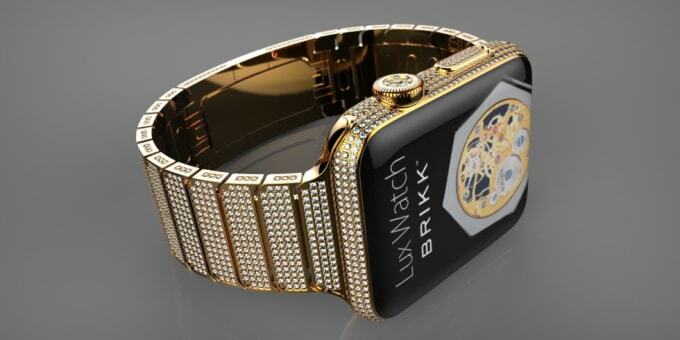 The pricey model is dubbed the The Lux Watch Omni and every centimeter of the gold piece is encrusted in row after row of diamonds, even the buttons have their own bling. Brikk&apos;s 30 customizable options start at $7,500 and come in luxe materials like 24-karat gold, 18-karat pink gold, and 950 platinum. The most expensive option Apple plans on selling, the 18-karat gold Watch Edition, is rumored to clock in at a relatively cheap $5,000. Apple will officially announce its watch on March 9 and start shipping them in April. You can already pre-order Brikk&apos;s Lux Watches on its website, though, with shipping planned four to six weeks after the official Apple release.